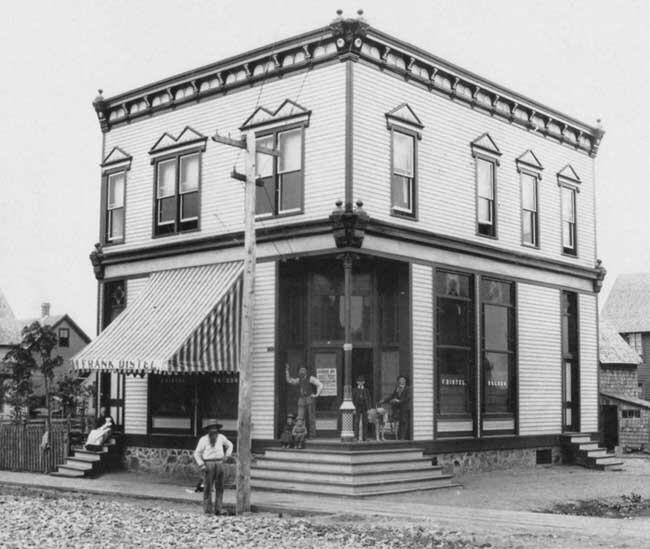 This is a photograph of Frank Distel's saloon in Calumet, Michigan, contributed by Tony Distel, the proprietor's great grandson. Tony believes the picture was taken prior to World War I.
Calumet is known for the Italian Hall Disaster of 1913, in which 73 people were tragically killed during a stampede at a crowded Christmas party when someone wrongly cried out, "Fire!" Folk music legend Woody Guthrie wrote a song about the incident, "1913 Massacre." Have an inside look at the Michigan History Project's latest publications of our state's amazing and inspring history. Get your memories and mementoes out of the box and into the light, where they can be seen and appreciated. Don't let your historical treasures end up in the trash. Now is the time to act! Read about the Michigan History Project's plans for future efforts in bringing the exciting stories of our state's past to brilliant life. The Michigan History Project is a 501(c)(3) non-profit organization committed to bringing archives alive and making them available to the widest possible audience through compelling and relevant media. If you are interested in contributing to our efforts or discussing the Michigan History Project's aims and objectives, please visit the contact page.